and hard, but would end with spectacular success. your side, so he could aid you in your distress. the breast,' to the father you had to confess." "...the lords and the captains who were with her, seeing that they could not well gain it this day, considering how late it was and also that they were all very tired and worn out, agreed among them to sound the retreat for the army. This was done, and, at the sound of the trumpet call, each one retreated for the day. During this retreat, [d'Aulon] who had been carrying the standard of the Pucelle and still holding it upright in front of the boulevard was fatigued and worn-out, and gave the standard to one named Le Basque, who was with the Lord of Villars. And because [d'Aulon] knew Le Basque to be a brave man, and he feared that harm would come from the retreat, and that the fortress and the Boulevard would remain in the hands of the enemy, he had the idea that if the standard were pushed ahead, due to the great affection in which it was held by the soldiers, they could by this means win the boulevard. And then [d'Aulon] asked Le Basque if he would follow him when he entered and went to the foot of the boulevard; he said and swore he would this. And then [d'Aulon] entered the ditch and went up to the base of the side of the Boulevard, covering himself with a shield for fear the stones, and left his companion on the other side, believing that he would follow him step-by-step. But when the Pucelle saw her standard in the hand of Le Basque, because she believed that she had lost it, as [d'Aulon] who had been carrying it had gone into the trench, she came and took the standard by the end in such a way that he had to let it go, crying, "Ha! My standard! My standard!" And she shook the standard in such a way that the one who is testifying imagined that others might think that she was making a sign to the others by doing this. And then he who was speaking cried: "Ha, Basque! Is this what you promised me?" And then Le Basque tugged at the standard that he dragged it from the hand of the Pucelle, and after this, he went to [d'Aulon] and brought the standard. 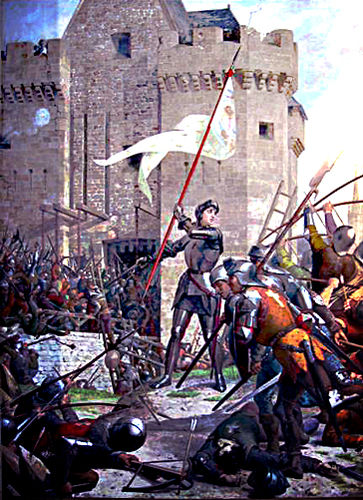 Because of these things, all those in the army of the Pucelle gathered together and rallied again, assailed this boulevard in such great fierceness that, a short time afterwards, the boulevard and the fortress were taken by them, and abandoned by the enemy, and the French entered the city of Orleans by the bridge..."
This was indeed Joan of Arc's Longest Day!